Criminal Finance Act 2017 – Where are we now? All the provisions of the Criminal Finance Act 2017 are now in force and we are seeing the provisions being utilised. Unexplained Wealth Orders have been pushed to the forefront, due to the perception of politicians that they can be used against Russian targets, whilst the use of Account Forfeiture Orders is increasing exponentially. Other provisions are still being developed. There are a number of issues emanating from the extension of moratorium periods and no prosecutions have been brought under the new Tax Evasion offences. Over the next month I will be publishing a series of articles which set out the law in relation to the key provisions of the Criminal Finance Act 2017 and how they have developed in practice. 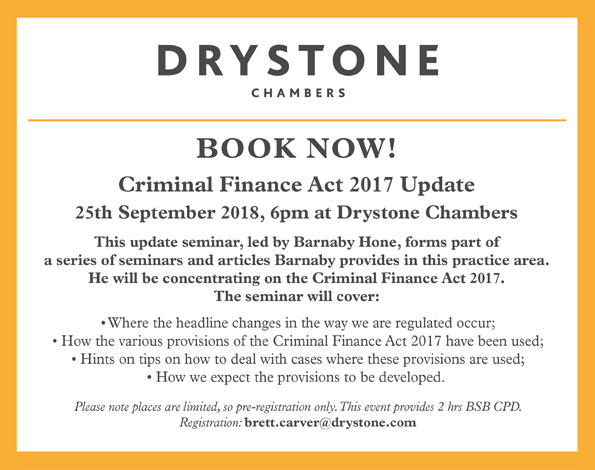 On the 25th September I will be hosting a Criminal Finance Update seminar at Drystone Chambers, see invitation below. It is a free law and practice update concluding with a chance to network and share drinks and canapes with fellow delegates. As places are limited, pre-registration is recommended. If you or any colleagues wish to attend this seminar please email Brett Carver at brett.carver@drystone.com. We also regularly provide training or legal update seminars at our clients offices are throughout the country. If you are interested, please contact Brett. If you have any questions or suggestions for further seminars or articles relating to POCA matters, please do not hesitate to contact me at Barnaby.Hone@drystone.com.